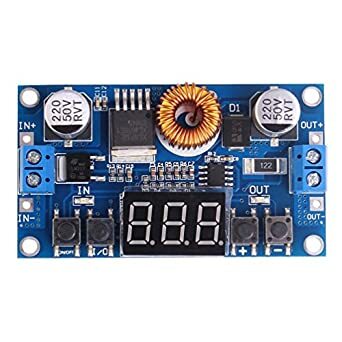 Schematic for power supply module ? Uses a XL4015E1 chip, and a MCP6002i. Probably made by 'WHDTS' Do you know its schematic ? Presumably there's also a microcontroller somewhere, that does all the work?. Found application note of a previous model module. That chip will be a microcontroller, doing all the work. The datasheet for the regulator chip doesn't really help, that's easily available and obviously doesn't mention any extra control circuitry.